Gene Sarazen (/ˈsɑːrəzɛn/; February 27, 1902 – May 13, 1999) was an American professional golfer, one of the world's top players in the 1920s and 1930s, and the winner of seven major championships. He is one of five players (along with Ben Hogan, Gary Player, Jack Nicklaus, and Tiger Woods) to win each of the four majors at least once, now known as the Career Grand Slam: U.S. Open (1922, 1932), PGA Championship (1922, 1923, 1933), The Open Championship (1932), and Masters Tournament (1935). Born as Eugenio Saraceni in Harrison, New York, his parents were poor Sicilian immigrants. Sarazen began caddying at age ten at local golf clubs, took up golf himself, and gradually developed his skills; he was essentially self-taught. Somewhat novel at the time, he used the interlocking grip to hold the club. Sarazen took a series of club professional jobs in the New York area from his mid-teens. In 1921 he became professional at Titusville (Pa.) Country Club, and he contracted to be the professional at Highland Country Club near Pittsburgh, Pa. in 1922. He arrived in April, stocked the golf shop and gave a few lessons, but spent most of his time at Oakmont Country Club practicing with Emil Loeffler. At some point, the pair visited Skokie Country Club to practice on the course that would hold the 1922 U.S. Open. In July, he came from four shots behind to win the tournament. He returned to Pittsburgh and was feted at the William Penn Hotel, where he burst from a paper mâché golf ball. He did not return to Highland CC, broke his contract and became a 'touring' golf professional. Later that summer, he won the 1922 PGA Championship at Oakmont. He was a contemporary and rival of Bobby Jones, who was born in the same year; Sarazen also had many battles with Walter Hagen, who was nine years older. Sarazen, Jones, and Hagen were the world's dominant players during the 1920s. Rivalries among the three great champions significantly expanded interest in golf around the world during this period, and made the United States the world's dominant golf power for the first time, taking over this position from Great Britain. Sarazen has a plaque in his honor placed 195 yards out from the 15th green at Hororata Golf Club where he famously made a double eagle in the final round of sectional qualifiers. He earned his spot in his first United States open in 1920 at age 18. Some say it was his greatest achievement as an amateur. The winner of 39 PGA tour events, Sarazen was inducted into the World Golf Hall of Fame in 1974. He was the Associated Press Male Athlete of the Year in 1932, and won the PGA Tour's first Lifetime Achievement Award in 1996. He played on six U.S. Ryder Cup teams: 1927, 1929, 1931, 1933, 1935, and 1937. Sarazen claimed to have invented the modern sand wedge, and debuted the club (while keeping it secret during preliminary practice rounds) at The Open Championship at Prince's Golf Club in 1932 (which he won). He called it the sand iron, and his original club is no longer on display at Prince's as it is worth too much for the insurers to cover. However, a similar club was patented in 1928 by Edwin Kerr McClain, and it is possible Sarazen saw this club. Sarazen had previously struggled with his sand play and there had been earlier sand-specific clubs. But Bobby Jones's sand club, for example, had a concave face, which actually contacted the ball twice during a swing; this design was later banned. Sarazen's innovation was to weld solder onto the lower back of the club, building up the flange so that it sat lower than the leading edge when soled. The flange, not the leading edge, would contact the sand first, and explode sand as the shot was played. The additional weight provided punch to power through the thick sand. Sarazen's newly developed technique with the new club was to contact the sand a couple of inches behind the ball, not actually contacting the ball at all on most sand shots. Every top-class golfer since has utilized this wedge design and technique, and the same club design and method are also used by amateur players around the world. The sand wedge also began to be used by top players for shots from grass, shortly after Sarazen introduced it, and this led to a revolution in short-game techniques, along with lower scoring by players who mastered the skills. Sarazen hit "the shot heard 'round the world" at Augusta National Golf Club on the fifteenth hole in final round of the Masters Tournament in 1935. He struck a spoon (the loft of the modern four wood) 235 yards (215 meters) into the hole, scoring a double eagle. At the time he was trailing Craig Wood by three shots, and was then tied with Wood. Sarazen parred the 16th, 17th and 18th holes to preserve the tie. The following day, the pair played a 36-hole playoff, with Sarazen winning by five shots. The Sarazen Bridge, approaching the left side of the 15th green, was named in 1955 to commemorate the double eagle's twentieth anniversary, which included a contest to duplicate, with the closest just over 4 feet (1.2 m) away. It remains one of the most famous shots in golf history. In spite of his height of 5 ft 5 1⁄2 in (1.66 m), Sarazen was one of the longest hitters of his era. He played several lengthy exhibition tours around the world, promoting his skills and the sport of golf, and earned a very good living from golf. As a multiple past champion, he was eligible to continue competing after his best years were past, and occasionally did so in the top events, well into the 1960s, and occasionally into the 1970s. Throughout his life, Sarazen competed wearing knickers or plus-fours, which were the fashion when he broke into the top level. For many years after his retirement, Sarazen was a familiar figure as an honorary starter at the Masters. From 1981 to 1999, he joined Byron Nelson and Sam Snead in hitting a ceremonial tee shot before each Masters tournament. He also popularized the sport with his role as a commentator on the Wonderful World of Golf television show, and was an early TV broadcaster at important events. At age 71, Sarazen made a hole-in-one at The Open Championship in 1973, at the "Postage Stamp" at Troon in Scotland. In 1992, he was voted the Bob Jones Award, the highest honor given by the United States Golf Association in recognition of distinguished sportsmanship in golf. Sarazen had what is still the longest-running endorsement contract in professional sports – with Wilson Sporting Goods from 1923 until his death, a total of 75 years. He received an honorary degree in 1978 from Siena College, in Loudonville, New York. In 1998, shortly before his death, the Sarazen Student Union was named in his honor. He also established an endowed scholarship fund at the college, The Gene and Mary Sarazen Scholarship, which is awarded annually to students reflecting the high personal, athletic, and intellectual ideals of Dr. Sarazen. For many years, kitted in his signature plus-fours, he hit the first ball in an annual golf tournament, held to raise funds for the scholarship. Sarazen died at age 97 in 1999 from complications of pneumonia in Naples, Florida. His wife Mary died thirteen years earlier in 1986, and they are interred at Marco Island Cemetery in Marco. In 2000, Sarazen was ranked as the 11th greatest golfer of all time by Golf Digest magazine. In 2018, T.J. Auclair ranked Sarazen as the ninth greatest golfer of all time. ^ "1932 Gene Sarazen". The Open. Archived from the original on October 16, 2013. Retrieved October 17, 2013. ^ Dorman, Larry (May 14, 1999). "Gene Sarazen, 97, golf champion, dies". New York Times. Retrieved February 17, 2009. ^ Starn, Orin (2006). "Caddying for the Dalai Lama: Golf, Heritage Tourism, and the Pinehurst Resort" (PDF). South Atlantic Quarterly. 105 (2): 452. ^ Somers, Robert (1987) The U.S. Open Golf's Ultimate Challenge. Atheneum. pp. 59–60. ISBN 0689115253. ^ "Special day for golfdom's Squire". Chicago Daily Tribune. United Press photo. April 7, 1955. p. 1, sec. 6. ^ "The Sarazen Bridge". masters.com. Retrieved January 8, 2017. ^ "Haas closest to Sarazen's double eagle". Pittsburgh Post-Gazette. Associated Press. April 7, 1955. p. 18. ^ Elliott, Len; Kelly, Barbara (1976). Who's Who in Golf. New Rochelle, New York: Arlington House. p. 168. ISBN 0-87000-225-2. ^ Sarazen, Mary Ann (November 29, 2014). "Dad didn't invent the sand wedge, but he modernized it". Golf Magazine. Retrieved July 6, 2016. ^ "Sarazen Student Union Naming Opportunities". Archived from the original on July 4, 2007. ^ Hardwig, Greg (May 15, 1999). "Golf: Ken Venturi remembers Gene Sarazen as 'dear friend'". Naples Daily News. Retrieved February 26, 2014. ^ Yocom, Guy (July 2000). "50 Greatest Golfers of All Time: And What They Taught Us". Golf Digest. ^ Auclair, T.J. (March 5, 2018). "15 Greatest golfers of all time". PGA of America. ^ Barkow, Al (1989). The History of the PGA TOUR. Doubleday. p. 266. ISBN 0-385-26145-4. 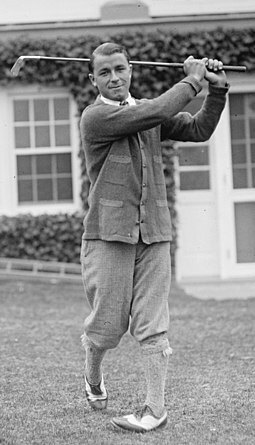 Wikimedia Commons has media related to Gene Sarazen.